Stop eating these 5 foods to start losing weight! I don't care what those Facebook graphics say, being fat is not where it is at and being obese is not cute! There is a huge difference between being "curvy" and having 30 pounds or more of fat in your body. It is dangerous to your health. 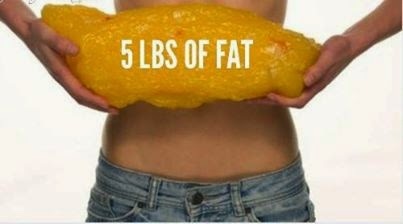 If that is not enough motivation for you, then think about 5 pounds of fat in your hands (see image below); it is really ugly and suffocates your organs. So, the next time you see one of those fat excuse quote graphics don't share it and help brainwash another generation of fluffy girls into thinking that "No one wants a bone but a dog" because it's not true. Think about it! Every creature out here - including the birds - go for the bones the raccoons drop from the trash. I am just being silly here, but you get my point. I'm not saying to aspire to be bone thin. I am just saying that if you are overweight it is better for you to lose weight than to join a curvy girl initiative that says to embrace the organ suffocating and heart damaging fat --- when you can simply lose it. Aspire to lose the weight and get healthier! I know what it's like to be 5, 10, 15, 20 ... 100lbs overweight after pregnancy. No one suggested that I embrace my fat curves because it is not healthy. In fact, health professionals all over the world have plenty to say about the dangers of being fat. Plus, it is not pleasant to have your pants fit snug at any weight. It's not nice to tell girls and woman that wearing a plus size is ok as long as you love yourself. If you love yourself, then you want to be your best all the way around. It is not ok to tell fat people that they are just curvy or a cute chubby and they should be happy with that. Plus size clothes were designed for people that cannot fit standard size clothes. The problem is that the size 10 of today is not as small as the size 10 of the 1970, so our clothes have already evolved for the larger size Americans to date, and plus size is even larger than that. Fat is fat - We need to stop justifying it! Curvy is an hour glass shape or pear shape. Obese is not curvy; it is fat. Obese is 30 lbs or more above your ideal weight. Extremely obese is 60 lbs above ideal weight. Morbidly obese is 100 lbs above ideal weight. 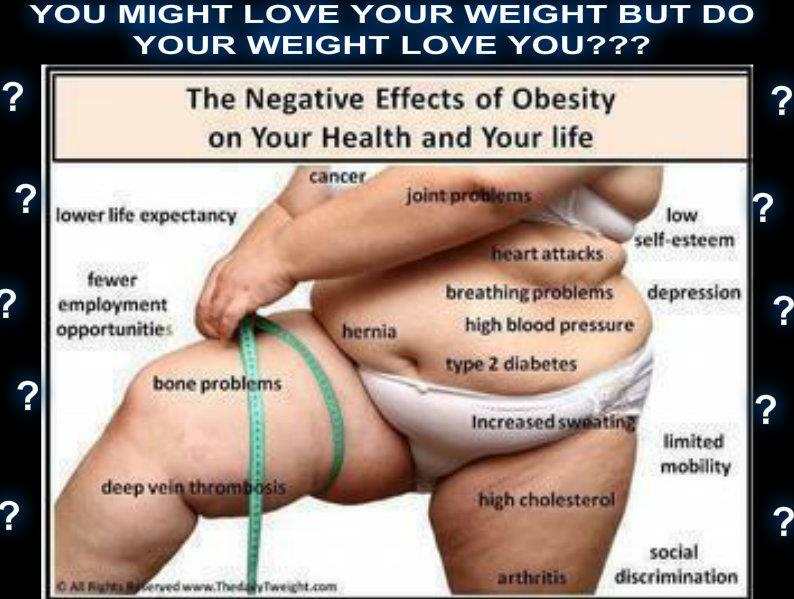 * Not all of this applies to people having weight problems due to health issues. You work with your doctor and follow my suggestion below on the 5 food items to eliminate from your diet. FAT IS FAT - UNHEALTHY IS UNHEALTHY - JUNK IN THE TRUNK IS NOT COOL! This is especially true in a nation that keeps becoming more and more obese, and encouraging it globally. When do you say, "Enough is enough?". For example, the women in the picture above are pretty models, but they are big girls. I have asked men what they think of the thick models in the picture and most said the same thing, "They are juicy ... would be prettier if they lost some weight", "They're thick, but ok", etc. I have asked women what they think and they start pointing out the good and bad qualities on the plus size models in this picture. Here's another point ... They are models. They are the crème de la crème of fat women, but they do not represent fat women at all because it is either that their good genes kept the "cottage cheese" to a minimum or it was brushed out by artists making the advertisement. This is more what fat looks like on a woman's body and that is not an attractive nor healthy body size at all!!! The negative affects of being fat and / or obese are low self esteem, lower life expectancy, cancer, joint problems, fewer employment opportunities, heart attacks, depression, breathing problems, high blood pressure, hernia, bone problems, increased sweating, limited mobility, high cholesterol, deep vein thrombosis, arthritis, social discrimination, diabetes and so much more!!! None of this is explained by people sharing Facebook graphics, lyrics from rap music and inspirational quotes about being fat. Stop eating these 5 food items and start losing weight! This is self explanatory, but here it goes ... NO PEPSI, NO COCA COLA / COKE, NO SPRITE, NO STORE BRAND GENERIC POPS - No Kool Aid, No Whylers, No Lemon Aid or Fruit Drink made from concentrate and sold at restaurants and at stores (like Hawaiian Punch). Processed foods, microwave meals, frozen pizza, etc. From now on, if you must eat package foods, turn the package over and see how much sodium is in that food you are thinking about eating. It is not good for you and even the healthiest at young can see the negative affects of salt as they grow older. Fruit sugar is OK depending on what foods you are combining them with, but granulated sugar, brown sugar, foods with sugar that does not come from fruit ... GIVE THE UP!!! If you can't give them up, then try Stevia, Agave or pure honey. Sugar is included in this, but I am referring to empty calorie foods like cereals, pasta, quick snacks, crackers, white rice, etc. You can replace pasta with spaghetti squash, spiral squash or Shirataki noodles; you can replace rice with cauliflower rice; you can have smoothies or oatmeal for breakfast; fruits and veges are wonderful snacks. Although butter is better for you than margarine and an equivalent to olive oil, you can do better to reduce or eliminate it from your diet. Fresh cheddar is way better than processed American cheese (ironic that a cheese named after a processed obese nation should not be good for us, right?) and low fat mozzarella takes the prize when wanting to eat cheese, but the fact of the matter is that you do not need cheese; it can cause health issues and weight gain. Couple this with drinking more water and eating more raw veges, and you will start to see a different in your weight. Walk a mile 3 to 5 days a week and you will start to notice a significant difference in your body. Keep it up for another 30 days and people will really start to see the change in your body, too. Do it for another 30 days and it is more than likely that you will have dropped a few pant sizes depending on what else you are eating and HOW MUCH you are eating. That gets me to my last point: HOW MUCH WE EAT can hurt us. I did not say crash diet. I did not say starve yourself. I did not say controlling food portions is easy especially when you are used to eating more than is really needed. I AM SAYING THAT OBESITY comes from eating too much and eating too much of the wrong things. So, if you give up the 3 types of foods that I have mentioned, increase your intake of raw veges and start moving your body 30 minutes a day, you can lose weight as long as you are not loading up on the other foods to counteract your helpful / small changes. Don't forget to book mark this page and let me know how these tips are working for you! If you are really serious about losing weight, this 90 day weight loss challenge can help you start taking charge of that "junk in the trunk"; we can do this together if you really want to lose weight because support is extremely important.